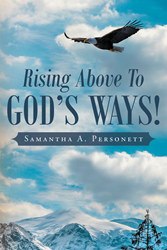 “Rising Above To God's Ways!” from Christian Faith Publishing author Samantha A. Personett is her personal quest to shed the judgement of the church and rediscover God in nature. By finding God in His own creation, Samantha A. Personett found hope, strength, and freedom. “Rising Above To God's Ways!”: a journey to find hope, strength, and freedom through faith and God’s creation. “Rising Above To God's Ways!” is the creation of published author, Samantha A. Personett. Samantha A. Stanage–Personett grew up in the small town of Three Oaks, Michigan, which sits near the beautiful Lake Michigan. Samantha has a degree in Early Childhood as well as a “Paralegal” Degree. Samantha attends Calvary Tabernacle where she has been a Sunday school teacher for around thirty years. Her hobbies are reading, writing while out in nature, photography, and boating as well as spending time with family and friends. Samantha loves to bake with her mother and sister. She especially loves to learn old recipes from her mother’s family. She loves being out in nature, walking on the beach, and collecting beach glass, rocks, and odd-shaped bottles. Samantha loves music and sings with the praise team at her church every Sunday. She also enjoys singing with her family at her parent’s house when they all get together. Samantha currently lives in Niles, Michigan and works in the office of a CNC Machine Shop. She loves people and wants to spread the gospel of Jesus wherever she goes. Published by Christian Faith Publishing, Samantha A. Personett’s new book is her journey to God through nature. As Author Samantha Personett started to really look to God for answers, she noticed the best answers were always found away from people and out in nature. In God’s creation, she was able to open her mind and heart to God. She remembers walking on the shores of Lake Michigan at Weko Beach. The caressing wind and fresh air were thoroughly invigorating. She remembers feeling overwhelmed by the fact that God had made so much beauty for her to enjoy. God met her that day, thus freeing her from the judgmental burden of the church’s traditions and prohibitions. From that day on, she began to look beyond mankind’s ways. She no longer worried about what others wanted from her. She no longer cared what the church wanted. She no longer carried guilt over her divorce, because she realized that God no longer wanted her to stay in a relationship poisoned by alcohol and drugs. In serving Jesus Christ, she broke free of mankind’s ideals. Walk with Author Samantha Personett on her journey through the natural world where she found hope, strength, and freedom once again. View a synopsis of “Rising Above To God's Ways!” on YouTube. Consumers can purchase “Rising Above To God's Ways!” at traditional brick & mortar bookstores, or online at Amazon.com, Apple iTunes store, Kobo or Barnes and Noble. For additional information or inquiries about “Rising Above To God's Ways!”, contact the Christian Faith Publishing media department at 866-554-0919.